*WHAT GLUE DO I USE? The Center for Beadwork & Jewelry Arts, in Nashville, Tennessee, offers a full program of classes and workshops in bead weaving, bead stringing, wire working, silversmithing and the business of craft. Session 2: Fringes, Edges, Straps, Bails, Surface Embellishments - Art or Not? That’s a powerful idea, — “as it is worn” — but, when making jewelry, we somewhat ignore it. We bury it somewhere in the back of our brains, so it doesn’t get in the way of what we are trying to do. We relegate it to a phrase on the last page of a book we have promised ourselves to read sometime, so it doesn’t put any road blocks in front of our process of creation. We like to follow steps, and are thrilled when a lot of the thinking has been done for us. We like to make beautiful things. But, we do not want to have to make a lot of choices. We don’t want anything to disrupt our creative process. We do not want to worry about and think about and agonize over jewelry “as it is to be worn.” Let’s not deal with those movement, architectural, engineering, context, interpersonal and behavioral stuff. We just want to make things. To most artisans, making jewelry should never be work. It should always be fun. Making jewelry should be putting a lot of things on a table in front of you, and going for it. Making jewelry just is. It is not something we have to worry about managing. It is easy to make, copy or mimic jewelry someone else has designed, either through kits or through imitation. Making jewelry is doing. Not thinking. We prefer to make jewelry distinct from any context in which it might be worn or sold. We don’t want someone looking over our shoulder, while we create. We don’t want to adjust any design choice we make because the client won’t like it, or, perhaps, it is out of fashion or color-shaded with colors not everyone likes. Perhaps our design choices at-the-moment do not fit with the necessities associated with how we need to market our wares to sell them. Our pieces might somehow be off-brand. All too often, we avoid having to think about the difficult choices and tradeoffs we need to make, when searching for balance. That is balance among aesthetics, functionality, context, materials and technique. And balance between our needs as designers and the wearer’s needs, as well. So, too, we shy aware from making any extra effort to please “others” or “them”. Even though this hardly makes sense if we want these “others” or “them” to wear our jewelry or buy our jewelry creations. Everything comes down to a series of difficult choices. We are resistant to making many of them. So we ignore them. We pretend they are choices better left to other people, though never fully sure who those other people are. We yearn to be artists, but resign ourselves to be craftspersons. We dabble with art, but avoid design. We hate to make trade-offs between art and function; that is, allow something to be a little less beautiful so that it won’t break or not drape and move well when worn. We hate to make things in colors or silhouettes we don’t like. We hate to make the same design over and over again, even though it might be popular or sell well. But make these kinds of choices we must! Your jewelry is a reflection of the sum of these choices. It is a reflection of you. You as an artist. You as a crafter. You as architect and engineer. You as social scientist. You as a business person. You as a designer. So, the more we can anticipate what kinds of choices we need to make, and the more experience we have to successfully manage and maneuver within these choices, the more enjoyable and successful our jewelry designs become … and the more satisfying for the people for whom we make them. Designers who are able to re-interpret the steps she or he go through and see them in “process” terms, that is, with organization and purpose, have the advantage. There are many different kinds of choices to be made, but they are interdependent and connected. Recognizing interdependency and connectedness makes it easier to learn about, visualize and execute these choices as part of an organized, deliberate and managed jewelry design process. I am going to get on my soap box here. We tend to teach students to very mechanically follow a series of steps. We need, instead, to teach them “Process”. Strategy. Insight. Connectedness. Contingency. Dependency. Construction. Context. Problem-Solving. Consequences. Good jewelry design must answer questions and teach practitioners about managing the processes of anticipating the audience, selecting materials, implementing techniques, and constructing the piece from one end to the other. Again, this is not a mechanical process. Often, it is not a linear step-by-step pathway. There is a lot of iteration – that is, the next choice made will limit some things and make more relevant other things which are to happen next. A “process” is something to be managed, from beginning to end, as the designer’s knowledge, techniques and skills are put to the test. That test could be very small-scale and simple, such as creating a piece of jewelry to give to someone as a gift. Or creating a visual for a customer. Or when you need to know the costs. Or, that test could be very large-scale and more complex, such as convincing a sales agent to represent your jewelry in their showroom. Better Jewelry Designers smartly manage their design processes at the boundary between jewelry and person. It is at this boundary where all the interdependencies of all the various types of choices we designers make are clearest and have the most consequence. What exactly does it mean to “manage design at the boundary between jewelry and person?” What kinds of things happen at that boundary? A person breathes. She moves. She sits at a desk, perhaps fidgeting with her jewelry. She might make sudden turns. She gracefully transitions from one space to another. She has shape, actually many shapes. Her jewelry serves many purposes. It signifies her as someone or something. It expresses her feelings. Or status. Or future intentions. Or past history. It ties her to people and places, events and times. It suggests power, or lack thereof. It hides faults, and amplifies strengths. It implies whether she fits with the situation. Jewelry attracts. It attracts seekers of the wearer’s attention. It wards off denigrators. It orients people to the world around them. It tells them a story with enough symbol, clue and information to allow people to decide whether to flee or approach, run away or walk toward, hide or shine. Jewelry has a feel and sparkle to it. It reminds us that we are real. It empowers a sensuality and a sexuality. It elevates our esteem. Sometimes uncomfortable or scratchy. Sometimes not. Sometimes reflective of our moods. Othertimes not. Jewelry is a shared experience. It helps similar people find one another. It signals what level of respect will be demanded. It entices. It repels. It offers themes both desirable and otherwise. Jewelry has shape, form and mechanics. All the components must self-adjust to forces of movement, yet at the same time, not lose shape or form or maneuverability. If a piece is designed to visually display in a particular way, forces cannot be allowed to disrupt its presentation. Jewelry should take the shape of the body and move with the body. It should not make a mockery of the body, or resist the body as it wants to express itself. Jewelry defines a silhouette. It draws a line on the body, often demarcating what to look at and what to look away from. What to touch, and what to avoid. What is important, and what is less so. Managing here at the boundary between jewelry and person means understanding what wearing jewelry involves and is all about. There is an especially high level of clarity at this boundary because it is here where the implications of any choice matters. The choice of stringing material anticipates durability, movement, drape. The choices of color and shape and silhouette anticipate aesthetics, tensions between light and shadow, context, the viewer’s needs or personality or preferences at the moment. The choice of technique anticipates how best to coordinate choices about materials with purpose and objective. The choice of price determines marketability, and where it’s out there, and whether it’s out there. You choose Fireline cable thread and this choice means your piece will be stiffer, might hold a shape better, might resist the abrasion of beads, but also might mean less comfort or adaptability. You choose cable wire and this choice means that your piece might not lay right or comfortably. A necklace will be more likely to turn around on the neck. It might make the wearer look clownish. At the same time, it might make the stringing process go more quickly. Efficiency translates into less money charged, and perhaps more sales. You choose to mix opaque glass with gemstone beads, mixing media which do not necessarily interact with the eye and brain in the same way. This may make interacting with the piece seem more like work or annoying. The ends of your wirework will not keep from bending or unraveling, so you solder them. Visually this disrupts the dance you achieve with wire bending and cheapens it. You choose gray-toned beads to intersperse among your brightly colored ones. The grays pick up the colors around them, adding vibrancy and resonance to your piece. The gaps of light between each bead more easily fade away as the brain is tricked into filling them in with color. 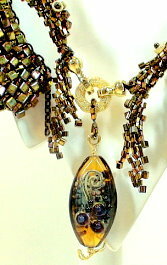 You mix metalized plastic beads in with your Austrian crystal beads. In a fortnight, the finish has chipped off all the plastic beads. You construct a loom bracelet, flat, lacking depth or a sense of movement. Your piece may be seen as pretty, but out of step with contemporary ideas of fashion, style, and design. If we pretend our management choices here do not matter, we fool ourselves into thinking we are greater artists and designers than we really are. Defining what I do as a “Project To Be Managed” — My Project is seen as a “system”, not merely a set of steps. The “system” encompasses everything it takes that enables creativity and leads it to success. These include things related to art, architecture, engineering, management, behavioral and context analysis, problem-solving, and innovation. For some designers, these also include things related to business, marketing, branding, selling and cost-accounting. Elaborating on the purpose or mission of my Project – why am I doing this Project as it applies to me, and as it applies to others? Applying design principles of composition, form and structure. Paying careful attention to building in architectural pre-requisites, particularly those involved with support, jointedness and movement. Evaluating whether I could repeat this or a similar Project with any greater efficiency or effectiveness – The better jewelry artist is one who is more reflective. Designing jewelry demands that we both do and think. Create and manage. Experience and reflect. The better Jewelry Designer sees any Project as a system of things, activities and outcomes. These are interconnected and mutually dependent. Things are sometimes linear, but most often iterative – a lot of back and forth and readjustments. The better Jewelry Designer is very reflective. She or he thinks about every detail, plays mental exercises of what-if analyses, monitors and evaluates all throughout the Project’s management. She or he thinks through the implications of each choice made. The Designer does not blindly follow a set of instructions without questioning them. At the end of the day, your jewelry is the result of the decisions you made. We should teach students to design jewelry, not craft it. Rather than have students merely follow a set of steps, we need to do what is called “Guided Thinking”. For example, we might encourage students to construct and feel and touch similar pieces made with different materials, beads and techniques, and have them tell us what differences they perceive. We should guide them in thinking through the implications for these differences. When teaching a stitch, I typically have students make samples using two different beads – say a cylinder bead and a seed bead, and try two different stringing materials, say Fireline and Nymo threads. We also should guide them in thinking through all the management and control issues they were experiencing. Very often beginning students have difficulty finding a comfortable way to hold their pieces while working them. I let them work a little on a project, stop them, and then ask them to explain what was difficult and what was not. I suggest some alternative solutions – but do not impose a one-best-way – and have them try these solutions. Then we discuss them, fine-tuning our thinking. I link our developing discussions to some goals. We want good thread management for a bead woven piece. We want the beads to lay correctly within the piece. We want the piece to feel fluid. We return to Guided Thinking. I summarize all the choices we have made in order to begin the project: type of bead, size of bead, shape of bead, type of thread, strategy for holding the piece while working it, strategy for bringing the new bead to the work in progress. I ask the students what ideas are emerging in their minds about how to bring all they have done so far together. At this point, I usually would interject a Mini-Lesson, where I demonstrate, given the discussions, the smarter way to begin the Project. In the Mini-Lesson, I “Think Aloud” so that my students can see and hear how I am approaching our Project. And then I continue with Guided Thinking as we work through various sections of the Project towards completion. Whatever we do – select materials, select and apply techniques, set goals, anticipate how we want the Project to end up – is shown as resulting from a managed process of thinking through our design. In “Guided Thinking”, I would prompt my students to try to explain what is/is not going on, what is/is not working as desired, where the student hopes to end up, what seems to be enhancing/impeding getting there. With guidance, demonstration and repetition, it is my hope that such thinking becomes a series of Thinking Routines my students resort to when starting a new project. As students develop and internalize more Thinking Routines, they develop greater Fluency with design. And that should be our primary goal as teachers: developing our students’ Fluency with design. This entry was posted on January 4, 2018 at 10:33 pm	and is filed under Art or Craft?, bead weaving, beads, beadwork, business of craft, design management, jewelry design, jewelry making, Learn To Bead. Tagged: beading, design management, jewelry design, jewelry design theory. You can follow any responses to this entry through the RSS 2.0 feed. You can leave a response, or trackback from your own site.